Just showing off a fraction of Mr MB's mango harvest from our very own garden. Goodness me, with a Christmas feast like that planned, you'll need a LARGE waterfront apartment just to store everything. Sounds great, I'll just get Mrs BB to whip up something similar.. or, maybe we'll go to the large family gathering on the Central Coast where egalitarianism rules (BYO). ... we now have a new family member - all is revealed on Blog.. 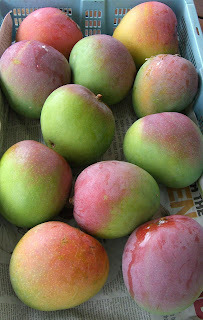 I can vouch for these Mangoes. We ripend the garden mangoes in Brisbane. Lucky me noone to share them with. When can I get the rest?